Reversi is a game for 2 players. The object is to finish the game with more pieces turned to your color than your opponent. To play you need a reversi board and playing pieces. This consists of a 64-square (8 by 8) checker board plus 64 playing pieces. The pieces resemble plastic coins. One side is black and the other is white. 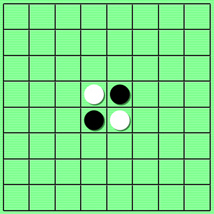 Reversi games are sometimes sold under the brand name “Othello”. From this point on, players may place pieces in any square following the rules described below. Black goes first. On your turn, place one piece on the board with your color facing up. You must place the piece in such a way that one or more opponent pieces are trapped (sandwiched) between two of your pieces. You then turn over all of the opponent pieces trapped in the row between your pieces so they become your color. This is called “capturing” your opponent’s pieces. You can capture rows diagonally, horizontally or vertically. You may capture more than one row of pieces at the same time. If you do not have a legal move, you must pass your turn. The game ends when all squares are filled in or when neither player has a legal move. The player who has the most pieces turned to their color at the end of the game is the winner. – In this variation, either player may offer to declare the game a draw during their turn. The opponent may accept or decline the offer.